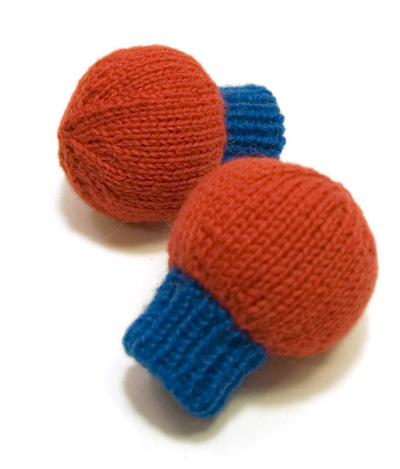 These cute little mitts were inspired by the bowling game that comes with the Nintendo Wii. In it, your character has floating spheres for hands, and I thought it would be adorable as a mitten for an infant (since they don't need thumbs in their mittens when they're very young). The padding in the hand shape keeps babies' hands nice and toasty warm, too! The Miittens are knit as a single piece beginning with the interior shell, which is then folded inside the outer shell before it is stuffed and sewn shut. Note: Gauge for this project is quite a bit tighter than ball band gauge for this yarn. [Kfb] in each st. 6 sts. Divide sts evenly between 3 double-point needles and join to begin working in the round, being careful not to twist. Round 1: [K1, kfb] three times. 9 sts. Round 2: [K2, kfb] three times. 12 sts. Round 3: [K1, kfb] six times. 18 sts. Round 5: [K2, kfb] six times. 24 sts. Round 7: [K7, kfb] three times. 27 sts. Round 9: [K8, kfb] three times. 30 sts. Rounds 10-15: K all sts. Round 16: [K3, k2tog] six times. 24 sts. Round 7: [K1, kfb] twelve times. 36 sts. Round 10: [K11, kfb] three times. 39 sts. Rounds 11-16: K all sts. Round 17: [K5, k2tog, k4, k2tog] three times. 33 sts. Round 18: K2tog, k to end. 32 sts. Work in 1x1 Rib until cuff measures 2.5 inches. Break CC, leaving a tail approx. 10 inches long. Round 1: Using MC, k all sts. Round 2: [K1, kfb] twelve times. 36 sts. Round 4: [K3, kfb] nine times. 45 sts. Rounds 5-6: K all sts. Round 7: [K14, kfb] three times. 48 sts. Rounds 8-15: K all sts. Round 16: [K14, k2tog] three times. 45 sts. Round 3: [K7, kfb] four times. 36 sts. Round 5: [K3, kfb] nine times. 45 sts. Round 8: [K4, kfb] nine times. 54 sts. Rounds 9-16: K all sts. Round 17: [K4, k2tog] nine times. 45 sts. Round 1: [K3, k2tog] nine times. 36 sts. Round 3: [K1, k2tog] twelve times. 24 sts. Round 5: [K2, k2tog] six times. 18 sts. Round 7: [K1, k2tog] six times. 12 sts. Round 8: [K2, k2tog] three times. 9 sts. Break yarn, leaving a tail approx. 8 inches long. 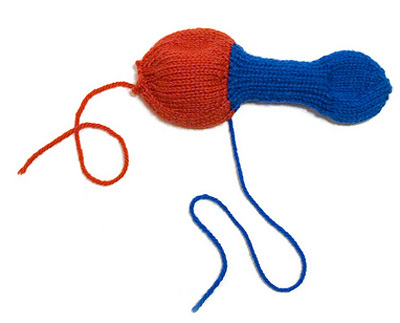 Draw tail through remaining sts but do not pull tight; mitten must be assembled first. Weave in CO end at tip of inner mitten. Tuck inner mitten inside outer mitten, folding cuff in half; when folded, cuff will be 1.25 inches deep, and doubled in thickness. Use CC tail at color change to sew inner and outer edges of cuff loosely together. With thumb or finger inside inner mitten, insert stuffing into opening at top of outer mitten. Gently stuff space between inner and outer mittens, distributing stuffing a little at a time, taking care not to overstuff. Pull tail to draw together sts at top of mitten. Weave in remaining ends. Michelle Hotchin knits, drinks and takes photographs of it all in Toronto, Ontario. She is one of the organizers of "Drunken Knitting", a monthly meetup of like-minded knitters, and is also an avid photographer. You can see it all on her blog.